The NASA - Cassini Spacecraft - on February, 15, 2016 - took this beautiful picture of the Saturnian moon Enceladus which shows us, among other things, a "Sinuous Surface Feature" that snakes Northward - from Enceladus' South Pole - like a giant tentacle. This Surface Feature, which stretches from the Terminator Line, toward the upper left (Sx) of Enceladus, is believed to be Tectonic in nature (which means that it was - better yet: might have been - created by powerful stresses that occurred on Enceladus' Icy Shell - Crust). Many Planetary Scientists and Geologists call the Surface Features, like this one, "Y-shaped Discontinuities". These "Y-shaped Discontinuities" are thought to arise when some (most likely "soft") Surface Material attempts to push Northward, thus compressing - or displacing - the existing Ice that is present along the way. Said Surface Features are also believed to be relatively Young, based on their lack of Impact Craters - and this is just a simple to understand reminder of how (surprisingly!) Geologically Active Enceladus STILL is. North on Enceladus is up. 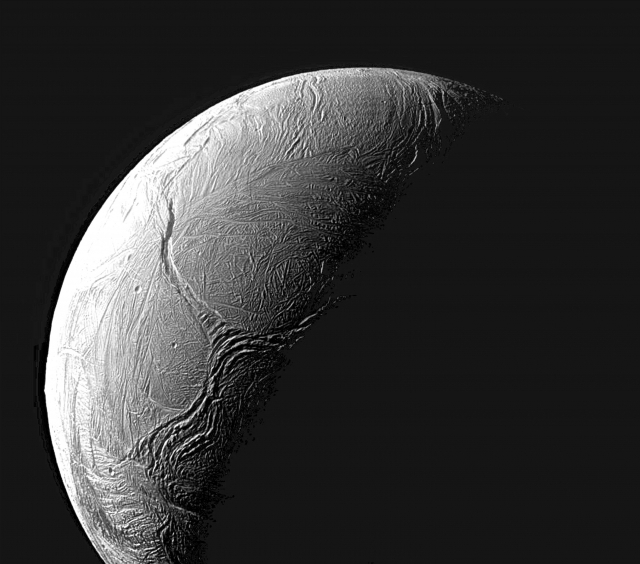 The Original Image looks toward the Trailing Hemisphere of Enceladus and it was taken in Visible Green Light with the NASA - Cassini Spacecraft's Narrow-Angle Camera. Furthermore, the view was acquired at a distance of approximately 60.000 miles (such as about 96.560,4 Km) from Enceladus. The Image scale is roughly 1900 feet (such as about 579,12meters) per pixel (or "Picture Element"). This frame (which is an Original NASA - CASSINI Spacecraft's b/w and NON Map-Projected image published on the NASA - Planetary Photojournal with the ID n. PIA 18366) has been additionally processed, contrast enhanced, magnified to aid the visibility of the details, Gamma corrected and then colorized - according to an educated guess (or, if you wish, an informed speculation) carried out by Dr Paolo C. Fienga - in Absolute Natural Colors (such as the colors that a human eye would actually perceive if someone were onboard the NASA - Cassini Spacecraft and then looked outside, towards the Saturnian moon "Enceladus"), by using an original technique created - and, in time, dramatically improved - by the Lunar Explorer Italia Team. Different colors, as well as different shades of the same color, mean, among other things, the existence of different Elements (Minerals) present on the Surface of Enceladus, each having a different Albedo (---> Reflectivity) and Chemical Composition. Note: it is possible (but we, as IPF, have no way to be one-hundred-percent sure of such a circumstance), that the actual luminosity of Enceladus - as seen in this frame - would appear, to an average human eye, a little bit lower than it has been shown (or, better yet: interpreted) here.